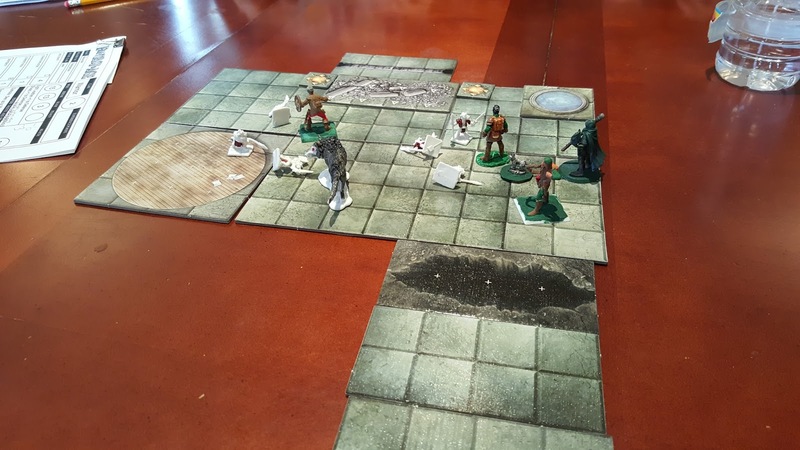 Last we left our party, the four cadets from Rivenshore - Alexander, Green, Potter and Blue - along with their new "friend" Tyler - a Loup de Noir that has been sent to make sure the party saves Jimmy and gets Fagan's treasure - are locked in two prison cells with nothing but their clothes on their back. With nothing but bones from dead rats, Potter amazingly manages to pick both cell locks. They break out of the cells and then hear footsteps down the hall. Then they hear Johnny telling Nate to pay attention, they don't want those "Rivenshore Rats" to get away. "Fagan has lots of torture in mind for them." Green recognizes their voices as two of the four thugs they fought when they first got to town. Nate finally agrees and unlocks the store room where they're equipment and weapons are. Once all armed, they make their way to the main room of the basement (where the jail and some housing is) and see three men, along with Potter's dog. 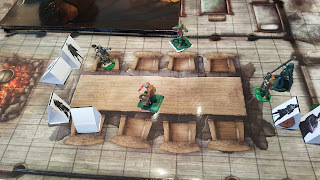 They attack them and although a couple of party members take some hits they manage to knock them all out, killing one. Green was psyched to get to use one of his invisibility potions to get to the dog and sneak attack. They make their way downstairs (the only way to go) and find themselves in a large hall leading to what looks like a chamber. They can see a 10 foot by 20 ft crack in floor, pitch black in the center with no way to see just how deep. They hear noises in the other room. With no chance for stealth one by one they jump over the 10' crack and are faced with half a dozen Kobolds who look to be guarding large double doors that are on the other side of the chamber. Tyler (the Loup de Noir who is helping them) turns into a wolf before jumping into the room and is the first to attack the Kobolds. Between a wolf, throwing knives, long sword, crossbow and Arcane Blast they make quick haste in killing the Kobolds. Then they notice that Nate is no longer with them. Potter manages to pick the lock and opens the double doors. Stepping into a cavern of sorts they see that they're underground. In front of them are several stone steps leading to a massive double door. A Man is trying to pick the lock and they call out to him. His name is Damon and he is Jimmy's uncle. He tells them that Jimmy was taken from his home and he knows they have him here - probably beating him up right now. They fill Damon in on what's been happening with them, why they're there. Damon tells them that Gregor is his brother. If Gregor wants the treasure it's to help rebuild after the civil war that's raged through Wolfwater, known to outsiders as the Wolf Den, for the past five years. Potter picks the lock and gets them inside. In the middle of a large room is a long table with a fire pit on the opposite side. They can see Jimmy and the guard that took the bribe from Alexander back at the tavern, letting the PC's get the kids. Both are tied to chairs and are beaten. Two men on Jimmy and a woman punching on the other man. Splitting forces, some take the men others the woman. Damon helps. There's a cook by the fire pit who makes his way out as the fighting ensues. The woman makes her way out, injured but mobile, as the others talk with the beaten guard, trying to enlist his help. Once the dust settles they search the premises finding several other rooms. Alexander finds some flint and steel, Potter finds a wet stone and Green finds a small sack with broken pottery that can be used as caltraps. With further searching Alexander finds the treasure chest.